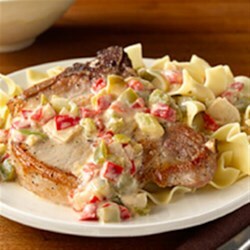 "Browned pork chops are simmered in a creamy sauce with lots of veggies, then served over noodles or mashed potatoes." Season pork chops, if desired, with salt and black pepper. Heat oil in large nonstick skillet over medium-high heat and cook pork chops turning once, 10 minutes or until golden brown. Remove chops from skillet; set aside. Add Recipe Ready Chopped Seasoning Blend and cook over medium-high heat, stirring occasionally, 5 minutes or until vegetables are softened. Stir in soup and milk; bring to a boil. Reduce heat to low and add back pork chops. Simmer 5 minutes or until pork is cooked through. * Serve over hot cooked noodles or mashed potatoes. *Cook pork to an internal temperature of 145 degrees F as measured with a food thermometer; let rest 3 minutes. We really enjoyed this recipe. I added a couple cloves of garlic and some mushrooms, then served it with rice. Very good and easy, too. The recipe was wonderful. I put everything in a casserole dish and baked it at 350 deg for 1 hour. Wonderful! Quick, easy and good. Thanks.